We get a lot of questions from event planners and DIY Decorators about why Acrylic Beads are offered, why Crystal Glass is offered, and what the difference is between the two. Most of us want to make sure that we're using the right material for the job. Below is a video we filmed about Choosing the Right Beads, and then at the bottom of this page is a short video from Preston Bailey! High Grade Acrylic Beads with Jump Rings - These are beads that have a small silver jump ring inserted at the edge of each bead that connects one bead to the next. We use the highest quality Japanese materials to make these beads. Most of the Strands that we offer with jump rings are about 30 feet long. See the selection of ACRYLIC BEADS WITH JUMP RINGS HERE. The beads are crystal clear and look very much like glass or crystal. The benefit of Acrylic over glass is that small flaws and scratches can be easily buffed out. Acrylic can also be polished with a soft cloth and a wood polish such as Liquid Gold. Additionally, Acrylic Beads weigh MUCH less than real crystal. They are fancier than our �MOT" or Molded-On-Thread beads that are on our Beaded Curtains, but can be mixed together for an exceptional look. Another handy feature is that adding length or reducing length of each strand is as easy as adding or removing jump rings. It"s fast and easy. 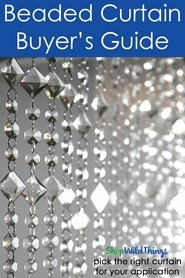 When creating a display that will be at eye-level with your guests, we feel that these Acrylic Beads with Jump Rings or Real Glass Crystal Strands of beads are a more sophisticated look. You can still use our �MOT" items up higher in the room for Ceiling Treatments, but at the table level use these higher grade Acrylic Beads. We also offer Acrylic Pendants that can be added to the bottom of Acrylic Beads with Jump Rings. Many of our clients simply cannot tell that our High Quality Acrylic Beads are not glass and MANY of our famous Event Planners use ours. Please be aware, though, there are super cheap knock-offs out there. Cheap acrylic will have very visible mold markings and will likely have a greenish/yellowish tint. We know we"re biased, but you do get what you pay for. ShopWildThings Acrylic Garland are used A LOT in floral Decor, and in fact the famous Preston Bailey recently did a HUGE installation using our Acrylic Beads with jump rings. See a short video of this special installation at the bottom of this page! Acrylic Beads Molded-On-Thread (�MOT") | These beads are the beads that you find on our long rolls of beads from 150-300 feet long See our STUNNING High Quality Acrylic MOT Rolls of Beads Right Here. The beads have string in the middle of them so that you can cut the strands to any length and the rest of the beads will not fall off. We use ACRYLIC beads (not plastic like many other sites) so the beads are sparkly and beautiful, not discolored or yellow-green tinted. 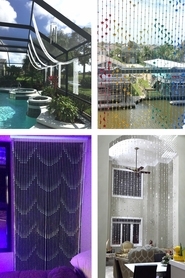 Our Acrylic Beads that are MOT are also used on all of our Beaded Curtains. 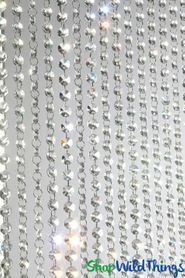 See our High Quality MOT Acrylic Beaded Curtains Here.Depending on the length of strands that you will need to be using, it is sometimes most affordable to purchase our Beaded Curtains and cut them up for strands. If you need very long strands of beads, you"d want to see if we have your chosen style available in a roll. 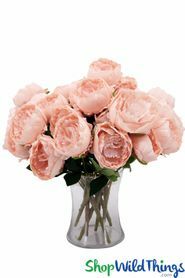 The quality of the Acrylic Beads Molded-On-Thread is very nice, but we"d probably recommend the Acrylic Beads with Jump Rings or Real Crystal Strands for your fancier Centerpiece and Floral Design Displays that will be right at eye-level for your guests. 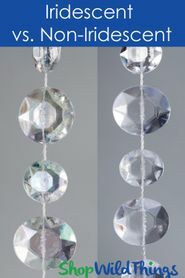 For displays that are up higher, such as hanging from the ceiling, these MOT beads would be fine and give you a ton of sparkle at a fraction of the price. 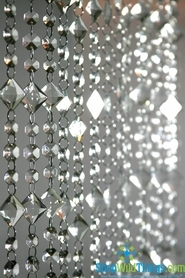 These beads are used in most of our Bestselling Event Chandeliers, Beaded Curtains, and Stunning Crystal Columns. Do not fear mixing MOT beads and Acrylic Beads with Jump Rings and Real Crystal Beads all in the same event. If you"d like to see some of our beads before making a decision, our team is always willing to send samples in the mail. Acrylic MOT beads come in two finishes: Non-Iridescent and Iridescent. If you"re interested in learning the difference between the two finishes, please see Iridescent Vs. Non-Iridescent Info. 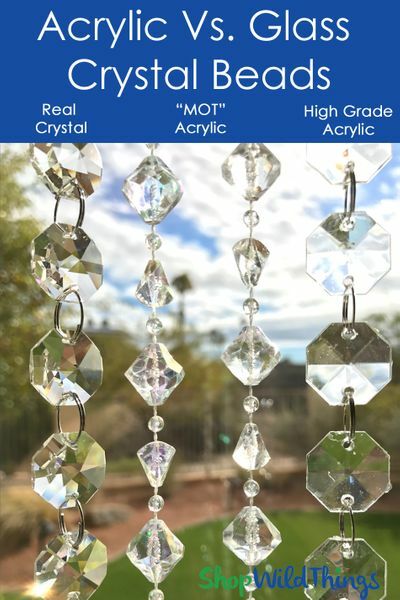 Real Crystal Beads - This is our fanciest option for beads and they are available in shorter strands by the dozen with pendants on the end or in longer strands as well. Our K9 Crystal Strands are the highest quality that you can get. If we"ve used K9 Crystal, we will indicate this in the product name and description. The facets and clarity and just overall beauty of these beads is stunning. They catch the light and throw prisms and rainbows of light everywhere. They are, of course, more prone to getting scratched. 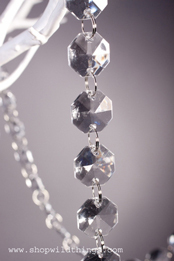 Real Crystal is heavier than the Acrylic Bead options, but they are definitely the fanciest option that we carry. 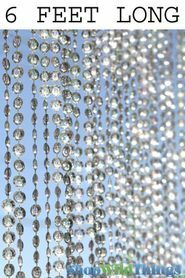 We make Custom Real Crystal Beaded Curtains, too�so let us know if you"re interested in that and we"ll work up a quote for you. If you'd like to see our Real Crystal Strands, we have them on FOUND ON THIS PAGE, mixed with the rest of our beautiful garlands. 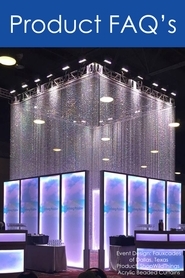 Mr. Preston Bailey created the structure below using Hanging Floral and Hanging Acrylic Crystals with Jump Rings - that he bought from ShopWildThings, of course!